On McCain's comments about Eisenhower's two letters — "He seems very authentic, he's not as nervous anymore"
On Obama's statement about how we got into this economic crisis — "I did this, I foresaw this...I, I, I"
On McCain vs. Obama's positions on spending — "This is the traditional Republic arguments an vs. the traditional Republican arguments"
Foreign affairs radio reporter, photographer, political commentator, poet. 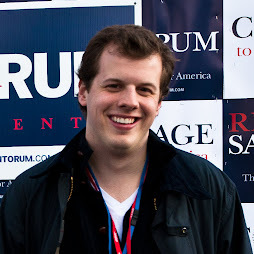 I am a multimedia reporter and political commentator who's covered two presidential elections from start to finish, across more than two dozen states. I currently work as a foreign affairs radio reporter at the United Nations, but my work takes me around the world to cover breaking news and feature stories. As a New Englander raised on the nearby New Hampshire primary, however, the air of elections never seems far off, and I look forward to providing more campaign coverage from the Granite State before too long. My campaign photography has been featured in print & online editorial for Polish and Norwegian outlets, commercial use by campaigns and PACs, exhibited in Germany, and was selected by the Nobel Committee to accompany Barack Obama's 2009 Peace Prize. Photos are available for purchase by campaigns, PACs, and by collectors at both the individual and institutional levels. Print or online media usage of my work is free with appropriate byline credit. Contact luke@politicalcourier.com for licensing information. In the early months of 2007 I scoured the internet for a fresh source of news about the New Hampshire primary. Outside of NECN and various blogs there wasn't much, especially anything from a student's perspective. Within a few days I was in the Granite State mingling with candidates, supporters, and staffers. Since then I haven't slowed down. Throughout the 2008 election I edited The POV Magazine and covered the campaign in nine states for various news outlets, as well as this blog. The 2012 election will bring more of the same as I the cover the twists and turns of the campaign from a variety of states and from my academic headquarters in New York. "I've Got a Bracelet, Too"
LIVEBLOGGING: Obama Makes the Rules, eh? What is "Youth Political Involvement?"